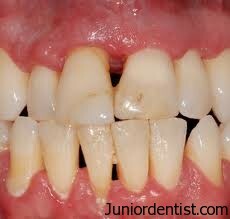 With Age increases the probability of Gum diseases in both genders. In a new Study Queen Mary, University of London in collaboration with research groups in the USA have published a study in the “Nature Immunology” Journal which reveals the increase in Gum Diseases due to age – Which is directly related to the drop in a protein Chemical called Del-1. What is Del-1 protein ? Del-1 protein is known to restrain the immune system by stopping white blood cells from sticking to and attacking oral tissue.Which means, that the decrease in quantity of Del-1 protein indirectly affects the increase in Bone loss. Hence if we understand why ageing makes us more susceptible and understanding this mechanism is the first step to an effective treatment. It is concluded that Del-1 is directly related to the increase in Periodontal and Gingival disease in Old age, hence if the Del-1 protein level is regulated it will prevent Bone loss and gingival disease. This research is surely going to be helpful in decreasing the amount of Gum Diseases in Old age. Great post! I didn’t think about gum aging from this perspective. Very informative.